This painting grew out of my Guston readings. Like Guston, I wanted to paint an object that is part of my everyday world. I saw this as a celebration of a thing that is well crafted and built to last. The design for a basic shoe has not changed for a long, long time. I was also striving for immediacy in getting the image down, using a projected image to get the placement just right. A funny thing happened as I worked on the piece. It became less about the shoe, or I should say less a celebration of this functional object. As in life, the shoe is begins to get lost in its surroundings. 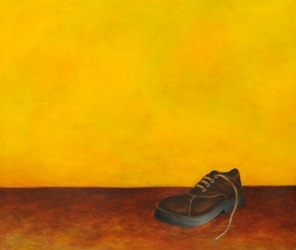 The large color fields, consisting of dozens of layers of paint, quickly draw a viewer's interest away from the shoe. I believe this painting will be a pivotal one. The push-pull between the mundane and sublime has opened up avenues of explorations.